Into thinking that I could get away with one more year of no trick-or-treating. Up until today, he seemed thrilled with just the prospect of wearing his costume and handing out candy on our front stoop. This morning he asked if he could invite friends over to hand out the candy with him. I explained that his friends probably had their own candy to hand out at their houses. Then I regretted not having a small Halloween get together which I had contemplated but couldn't bring myself to do. After last year, I wasn't really in the mood. Later on today, when school let out, we came home and prepared our treats. Then, with his costume on, we brought everything out to the stoop. 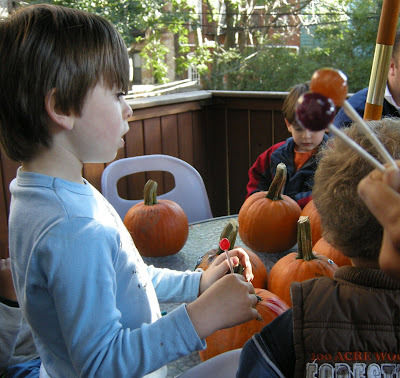 We had organic lollipops, freshly popped popcorn and other organic candy. I also made the most adorable Halloween treat ever (leftovers available if you are in the neighborhood tomorrow!). These ghosts will definitely become part of our Halloween repertoire. We will make them a tradition at our Halloween party next year. There we sat, trolling for trick-or-treaters but few were coming our way. I could see Izzy would tire of this soon enough. Finally T., one of his classmates, came by and I decided it wouldn't harm anyone if we joined them to trick-or-treat at a few houses. My little bat boy flitted down the street, eager to ring bells and accept candy. After about a half an hour of this, he was ready to go home. Once there, he promptly dumped out his loot and began to count it! He had over 60 pieces of candy. I explained to him that when I was little, my parents had the right to check over and discard anything that wasn't so good..like candies made in China, those with excessive food-coloring, the ones with sketchy labels.. He gladly handed over nearly half of the candy and was even on board with the one piece a week plan. Not bad for a first Halloween. Could it be the answer is a matter of opinion? My friend R. sent her daughter to school with a snack of aged Manchego and crackers yesterday. Today at breakfast her daughter M. said, "Mama, the teacher told me my cheese smelled like vomit. She said it was expired." R. could not believe her ears but her daughter repeated the same words. R. immediately called the school. It seems like someone at that school may need lessons in grace and courtesy. I have been using granny carts for years and do consider myself somewhat of an expert on the subject. So when my friend S. complained of a sore back from lugging groceries home from the city, I offered to help her purchase a granny cart, just like mine. After all, my granny cart woes of last year ended when I purchased my trusty blue metal cart which has served me well. We took the Path to 14th Street and headed for the hole in the wall shop where I have purchased a few carts. Surprise! It wasn't there. So we continued along to the second hole in the wall between 5th and 6th where I thought we might have better luck. I immediately spied a red metal cart that I thought would do, but upon further inspection I realized it was too wide and wouldn't fit through the Path turnstiles. The salesman tried to insist that it was a fine specimen. I shook my head no, as did my friend, who was deferring to me. I don't know if I said it, or she did but someone said that I was a granny cart expert and at that very moment, as I wiggled my blue cart, one wheel popped off, right before our eyes! Ah the irony of it all. So now we were both granny cartless, with high hopes of carting home loads of food from the market. We continued to walk towards Union Square, wondering where we would find granny carts in the neighborhood. We interviewed a couple of grannies along the way. The first one said hers was old and had no idea where it came from. The second one, inside Whole Foods, told us that she bought hers at Zabar's ages ago and that we should "Google It"...which somehow seemed awfully funny coming from a frail gray-haired woman who reminded me of my grandma (and my grandma had trouble wrapping her head around the concept of a tape recorder). By then it was too late to travel for a new granny cart so we both just used our bags and tried not to purchase too much. Which leaves us..Desperately Seeking New Granny Carts! To inaugurate it, I tried a new chocolate from Zabar's, just like I did last winter. This time it was a Sicilian chocolate from Casa Don Puglisi, which I found in an eco-friendly brown wrapper. I actually thought it was an eating chocolate at first but when I sampled its granular texture, I realized it was more well-suited to making hot chocolate. One square melted in about a cup of warm milk, made for a nice brew. Izzy and I enjoyed it thoroughly, though I can't be sure which one is tastier. It has been so long since last year's experiment, I think it is high time we had a hot chocolate tasting. On a recent trip to Englewood, N.J., on our way to dinner with my family at Baumgart's, I had the driver stop at the Balthazar Bakery store, actually a wholesale operation with a retail shop. We were greeted by this impressive mound of butter, evidence of the large scale operation going on beyond the glass window. Here they churn out a huge variety of impeccably made French bread pastries, along with their excellent breads. Everything is so wonderfully fresh and delicious it is always impossible to choose. Izzy and I love to peer into the back and watch the dough in motion. Our taxi driver, who decided to hop out and shop for himself (after I raved non-stop about the place), had so much difficulty choosing that he left the store with an armload of goodies. We were more judicious, a few croissants, some madeleines and a sourdough bread. If you find yourself in Northern New Jersey, this place is most definitely worth a detour, for that matter, it merits a special trip! New but not exactly French, this cozy comfort food restaurant boasts delicious frites, spicy pho and some rather tasty-looking sandwiches. And if you live in Jersey City, the location, right near the Christopher Street Path Station, couldn't be more convenient. This semester, Izzy is taking a mixed-media art class on Thursdays, in the West Village and naturally I am always looking for cozy places to dine afterwards. A. tried Mussels and Frites while Izzy and I had the Beet Salad and Brisket Pho...I eyed the Pulled Pork and Brisket Sandwiches, wondering what I might order next time. The menu is certainly eclectic, perhaps a tad pricey. I ordered the $16 bowl of pho, thinking that Izzy and I would share it. We did but both of us were still hungry. This certainly won't be the last you hear of The New French as we will definitely return. We just won't make it a weekly habit. What I would most like to know is where I left it. Did I leave it with the Sheep Lady while purchasing my fix of Brebis Blanche? Or was it left hanging by the egg stand? Did some fortunate Greenmarket shopper come across my lovely, lacy black number and wonder what to do with it? If not, perhaps it is resting by the checkout counter of the Whole Foods on 14th Street. If you have any information leading to the recovery of my lingerie splurge, wrapped neatly in a bag from Journelle, please do let me know. If not, I urge you to check out this store yourself for a truly sublime lingerie-shopping experience. They have robes to wear and disposable thongs so that you can try everything on... Whatever you do, don't lose your bra on the way to the Greenmarket, which is around the corner! That is a charming - and sad - story! We frequent the greenmarket a lot, too, but we didn't happen to see your lovely bra. We do, however, have one more in stock, and we've put it aside for you, our compliments. You can come pick it up anytime. Yucky dinner yuck yuck yuck, yuck yuck yuck, yuck yuck yuck, yucky dinner yuck yuck yuck, yucky dinner is yuck yuck.. It was supposed to be a fragrant, herby, chicken pot pie. I had made it many times before. This time I had to improvise as I was trying to make use of what was on hand. You see I had roasted a chicken last night, using a recommendation (I shall not name names so as to protect the innocent) from a friend whose cooking I have never tasted. The chicken, in and of itself was no prize but I thought I could surely do something with the leftovers. Perhaps the chicken simply wasn't meant to be. So many things went awry and what emerged from the oven was not at all what I had in mind. It might have helped if I had mixed the dry ingredients, instead I added wet to dry, without incorporating the salt or baking powder. I also used coarse cornmeal and then undercooked the whole thing, even though I kept it in the oven far longer than the recipe had indicated. Served along with some severely undercooked acorn squash, the dinner evoked pained looks all around. We all ate some of it, for what else could we have done? Order Chinese? And so I am left with half of this chicken pot pie with cornmeal crust, wondering if a night in the fridge will help its case and if I could manage to serve it to my friend D. for lunch tomorrow. Maybe if I serve it with some cheesecake brownies I plan make, she won't notice the main course at all. Sandwiches coming home untouched, pasta barely eaten, Izzy's lunchbox was coming home in a sorry state. Something was surely amiss in the lunchroom but I knew not what. So I adjusted his lunch and instead of the usual two to three items, I put one measly sandwich or a small amount of pasta and vegetables. Gone were any notions of packing a lunch like Albert's (including a whole array of delicacies) who is a character in one of our favorite story books, Bread and Jam for Frances. Instead I resigned myself to packing a paltry lunch for Izzy and then having a snack fiend arrive home from school at three o'clock and eat non-stop until dinner. The reason for this odd eating behavior (which has also afflicted many of Izzy's schoolmates): a change in lunchtime. Lunch is now eaten at 11:30 instead of noon. After eating breakfast at 8:30 and snack at who knows when, it is no wonder that Izzy is not quite hungry for lunch at 11:30. Haven't they heard of elevenses? Parents have voiced their concerns but since the lunch hour was changed as a result of various park issues, the lunch hour is likely to remain as is. It is up to the parents to come up with solutions. Some mentioned serving smaller breakfasts, which I am opposed to doing. Isn't breakfast supposed to be the most important meal of the day? Other ideas that might prove more effective are: limiting snack portions, offering lighter snacks such as fruit, and allowing access to lunchboxes after park time. An early lunchtime is certainly not ideal but neither is school lunching in general. If only we lived in France, where many school children still go home for lunch.. I guess Hebrew school is a fitting place for a first encounter with a bagel button. In my day, we just ate the whole bagel, hot from the oven of the nearby bagel shop. Eating that bagel was an integral part of my Hebrew school experience. Will the bagel button be a regular part of Izzy's? That shall remain to be seen. This was no ordinary Sunday at Hebrew school for we were also there to celebrate Sukkot, a harvest holiday, and decorate the sukkah. The sukkah is a hut-like structure, decorated with fruits and leaves. It is traditional to eat inside it, throughout the holiday. We expected to have our lunch inside the sukkah that afternoon. I had no idea what would be served but as you might imagine, I feared the worst. We were all milling about outside when a stack of pizza boxes arrived. I was certain it was a joke but then it quickly dawned on me that this was the reality of a Reform Synagogue in a multi-cultural city. Pizza and salad? I could certainly manage that it was the beverages that had me in a tizzy. I tried to ignore the giant plastic bottles of soda set out nearby, instead plying Izzy with far too much grape juice. When the festivities were over, Izzy and I took a nice long walk down Kennedy Boulevard, to the Journal Square Path Station. On our way, Izzy started asking about his teacher Yoni, and was already looking forward to next week's class. And perhaps the bagel buttons. It was an auspicious beginning. In my latest attempt to curb food waste, I tried to become inspired by what was in my fridge. With the odds and ends I discovered, I managed to make two satisfying meals. The first dish made use of some leftover roast chicken, red pepper, onions and tomato from my CSA, sour cream on the cusp of turning, a half zucchini destined for compost and some vintage tortillas. The recipe couldn't be simpler. 1. In a few tablespoons olive oil, saute onion and red pepper 10 minutes, add tomato and cook until onions are soft and slightly browned. 2. Add chicken and oregano. Stir and cook until heated through. 3. Sprinkle with cilantro and fill tortillas. 4. Serve with sour cream, shredded cheese and a side of rice. The second recipe used up half a red cabbage. I simply cut lengthwise and crosswise into small pieces, sauteed briefly in olive oil and drizzled with soy sauce. This made a perfect side dish for some bean curd, garlic, and chives. I generally slow cook cabbage but now I have a new option. Nigella Lawson's talk was another in the New York City Wine and Food Festival Times Talk series. We were in the second row so we had an excellent vantage point at which to view her quite bosomy, voluptuous body.. The focus of the talk was simply to showcase her passion for food, both cooking and eating it. The highlight of the event was the audience question segment. One participant asked about what a perfect day of eating would include for her. She said that she never begins her day without two mugs of tea and she then needs to wait an hour before breakfast. Her perfect breakfast was a piece of wholemeal toast with good butter and an Italian soft-boiled egg (why Italian is what I want to know. Wouldn't any fresh egg do?). This would then be followed by a lunch of linguine with clam sauce (with not a speck of tomato) and then a dessert of zabaglione, chosen in the interests of keeping the meal light! Dinner would be a roast chicken with some type of fried potatoes (I can't remember) and also some rare steak. Chocolate pot de creme for dessert. There may have been another item but whatever it is now escapes me. Were there any vegetables included? It may be my memory failing but I'd have to say I don't think so. Nothing earth-shattering here, just a few hours spent in the presence of this lovely personality who has the good fortune to have made such a successful career out of eating, cooking and writing about it. p.s She signed my food-stained copy of Nigella Bites ( with love..). I asked her how she managed not to eat everything she baked and she said, by never depriving herself of anything. Why doesn't that trick work for me. I certainly don't deprive myself but have still been known to eat one scone too many. Izzy rejoices in bagel decadence: butter and cream cheese together. Yom Kippur, the day of atonement has arrived. Not only is this a time to fast but it is also a time to reflect upon what and who we have done wrong during the past year. Tonight, after attending services (at least part of them, since Izzy joined me and we couldn't stay for very long), I came home to clean out my fridge. After all, as I cleanse my body through fasting, I figured my fridge could use a thorough cleansing as well. Moldy tomatillos, mushy onions, wilted par-cel and sodden eggplants were only some of the vegetables I encountered which were destined for fridge compost. All of this wasted food is a terrible shame, on so many levels. What an awful example I am setting for Izzy. Surely I can change. But how? If you have overcome fridge compost issues, do send tips as I pledge to do better next year. One of the first things that A. did upon his return was to go out into the yard and check on Mama. Since he is taller than I he had a much better vantage point from which to peer through the vegetation. He immediately noted that there was only one kitten curled up beside her. I had been hoping that others were hiding beneath her and I wasn't quite ready to believe him. I don't even want to think about what has befallen the others, I guess a similar sad fate as the one we tried to save. I finally called up one of the Jersey City cat mavens to discuss how to proceed. She advised me to wait until the kitten is about 3-4 weeks old before I attempt to capture it and the mama. We came up with a tentative plan, provided nature doesn't take over. Meanwhile I am to continue feeding Mama and checking on the whereabouts of the baby. So imagine my surprise upon finding this little gray bundle*, left solo this afternoon, snoozing away in this discarded fish pond. Where has Mama gone? She didn't stop at my kitchen. I checked for about an hour and then it became too dark. How long can that tiny creature remain alone? Let's just hope that Mama has made it back home by now, otherwise that poor thing will freeze. * Excuse the blurry image as I had to balance myself on a slab of stone and position the camera amongst the leaves. Oh what to make for the husband who lacks a solid sweet tooth? For one who isn't a huge fan of cakes or sweets in general? I could have gone the ginger cake route (btdt) but wanted to come up with a different birthday cake replacement. So I looked around my kitchen and found myself with a windfall of pears from my CSA. They were begging to be used and since I have actually seen A. order Tarte Tatin in restaurants, a Pear Tarte Tatin became the obvious choice. It is simple to prepare. It can hold candles and we would all be happy to eat it. It would also be the perfect dessert to accompany the bistro birthday dinner I had planned to prepare: Roast Leg of Lamb with Olive Tapenade, Zucchini and Leeks, Sweet potatoes roasted with honey/rosemary/olive oil, Cheese platter..and dessert. 2. Melt the butter in a tarte tatin pan (or deep skillet) over medium-high heat. Add pears and sugar. Cook, stirring occasionally to prevent burning, for 20 minutes. Increase heat to high and cook for 15 more minutes, until pears turn a deep, golden brown. Watch carefully to avoid burning the fruit. 3.If you are baking the tarte in a separate dish, pile pears into that dish. Otherwise, remove pan from heat and roll out pastry slightly larger than baking dish. Place pastry on top of fruit, tucking in along edges and down into dish. 4.Place tarte in center of oven and bake until pears bubble and pastry is a deep golden brown, about 35 to 40 minutes. 5.Remove the tarte from the oven and immediately place a large, flat heatproof serving platter on top of the baking dish or pan. Invert the pan and give the bottom a firm tap to release any pears that may be sticking to the bottom. Slowly release the baking dish so that the tarte falls evenly onto the platter. Serve warm or at room temperature, passing creme fraiche or sour cream. 1.Place 1 cup of flour, the butter, and salt in a food processor. Process just until mixture resembles coarse crumbs, about 10 seconds. Add the ice water and pulse just until the pastry begins to hold together, about 6 or 8 times. Do not let it form a ball. 2. Transfer the pastry to waxed paper; flatten the dough into a disk. If the dough seems too sticky, sprinkle with additional flour, incorporating 1 tablespoon at a time. Wrap the pastry in waxed paper. Refrigerate for at least an hour. * Definitely one of my favorite cookbooks, worth adding to your repertoire. My grandfather's penchant for sweets seems to increase with age. He has had a sweet tooth his entire life but lately it has been getting way out of hand. He seems to keep the local chocolate shop in business with his weekly orders and the last time I visited him he requested four pounds of raspberry jellies. When he first started buying chocolates from Birnn, he bought one pound. This quickly increased to two which seemed to last more than a week. Now he goes through at least two pounds a week if it is on hand and has been known to go through four. While visiting him a few weeks ago, he asked me to pick up four pounds for him and I refused. I figured if he had less he would eat less. Does anybody really need four pounds of chocolate a week? Yet when I tell this story most listeners have the same reaction: He is 99 and doing well..Let him eat what he wants. Where was "Mama" after giving birth? Shivering somewhere, huddling with kitties? Hungry? I had no idea. So at midnight last night, I went out into my cool, dark yard, calling softly for "Mama", who I hadn't seen since Saturday. "Mama cat. Mama cat. Mama cat." My soft pleas went unanswered as I made my way around the periphery of my yard. I don't like to be alone, outside in the dark but I had to do it. I headed inside and locked the screen door and finished puttering about the kitchen. Less than five minutes passed and then, lo and behold, she appeared by the door! My heart was aflutter. Sweet Mama had returned, sans bump, her girlish figure intact. As soon as I opened the door, she entered the kitchen and set to eating, quite ravenously at that. She then explored the kitchen, peered into the living room and dashed out the door. I tried to see where she went but she sped away into the darkness. Come this morning, I called for her again, while we were eating breakfast. No sign but she appeared after I dropped Izzy at school. She came in and ate quickly. This time I watched as she disappeared into my neighbor's yard, overgrown and jungle-like, it seemed the perfect hiding place for kitties, but I saw none. Later on I went back to look for her. I just had to find her. I climbed up my back wall (mind you I am not the most agile of creatures and this was in flip-flops) to gain a better vantage point. Still nothing. I came down and walked along the wall, peeking into the vegetation through the chain link fence when quite surprisingly, I found myself face to face with Mama. I had never been that close to her before and she didn't budge. For a moment I thought I had found the wrong cat since I expected her to jump. She just sat there, immobile as I looked at her, wondering where the kittens were. I couldn't quite grasp what had happened. Why was she sitting there, so still, with no kittens? Then, as I saw something dark wriggle, I realized she was practically sitting on top of them. I didn't want to frighten her so I left. All day long I pondered ways in which I could help her. Come dinner time I was yakking on the phone when I noticed her sitting on the porch of her cat house. I could only hope that the kittens were inside. She came in the kitchen to eat and I saw the house was empty. After her meal I watched as she made her way up the fence back to her nesting spot. So far the general consensus is to leave her and her babies be, for at least a few weeks. When the kittens grow stronger it will be easier to get them and less stressful for Mama. I want to take them all, Mama too. I have two potential takers for the kittens and I want to keep one kitty and Mama (who will probably remain an outdoor cat, but a fixed one who can visit). If there are more kittens, any other interest? My cat preoccupation has left me scant time for thinking about food. Good thing the Hamilton Park Farmer's Market was open today. There I found the fixings for a no cook meal, completely local save for the olive oil and balsamic vinegar. I picked up a hunk of venison salami*, definitely worth the $8 donation to Upper Meadows Farm, along with some mozzarella from Hoboken Farms. I added lettuce and tomatoes from my CSA, along with basil from my garden and bread from the local bakery. I drizzled some olive oil and balsamic vinegar over the cheese and greens and voila, our dinner was made. *I generally don't think of salami as a virtuous food but this salami is altogether different. It is neither greasy nor too salty, having been made with naturally lean venison meat, without any preservatives.